Lawrence was the most fashionable and also the greatest portraitist of his generation. He was made Principal Painter to George III in 1792 after Reynolds’s death, and received occasional commissions; however it was only after 1814 that George IV began to employ him in earnest. Charles, Count of Artois was the brother of the last pre-Revolution French King, Louis XVI (1754-1793). He spent the Revolutionary years in exile in Britain. The Restoration of 1815 brought his brother, Louis XVIII (1755-1824), to the throne, after whose death Charles X succeeded and was crowned at Reims cathedral on 2 May 1825 in the most Catholic, lavish (and last) French coronation. His reactionary policies precipitated the Revolution of 1830 which drove him into exile (which he spent at Holyrood Palace in Edinburgh). George IV commissioned this portrait, with that of the sitter's son, the Duke of Angouleme (RCIN 405142), in 1825 at a cost of 500 guineas each. Lawrence executed both in Paris in August to November 1625. The King is shown in dark blue uniform laced with silver, carrying his plumed hat on his left arm; wearing the star of the Garter and the St Esprit, the Golden Fleece and the ribbon of the St Esprit; the Tuileries Palace is visible in the background. 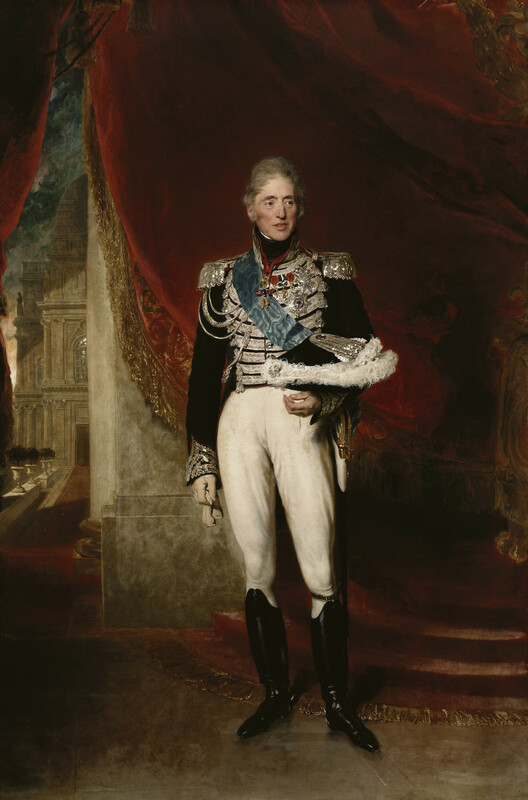 George IV took possession of this portrait in 1829; at which time it was hung in St James's Palace. By the 1840s it was hanging, as it does today, in the 'Waterloo Chamber', though whether or not originally intended for that location is uncertain. The Waterloo Chamber is a great hall on the public route at Windsor Castle displaying portraits of those soldiers, sovereigns and diplomats responsible for the overthrow of Napoleon and the re-establishment of the monarchies and states of Europe thereafter. The concept began in 1814 when George IV used the opportunity of the Treaty of London to commission Lawrence to paint distinguished visitors. The group of portraits grew during the next decade as Lawrence continued to obtain portrait sittings at the various congresses following the Battle of Waterloo in 1815 and, in some cases, by making special journeys. Most of the twenty eight portraits were delivered after his death on 7 January 1830. By this time work was already begun of the space of the Waterloo Chamber created by covering a courtyard at Windsor Castle with a huge sky-lit vault; the room was completed during the reign of William IV (1830-7). The first illustration of the interior is provided by Joseph Nash (1809-78) in 1844 (RCIN 919785) and shows the arrangement which survives to this day: full-length portraits of warriors hang high, over the two end balconies and around the walls; at ground level full-length portraits of monarchs alternate with half-lengths of diplomats and statesmen.